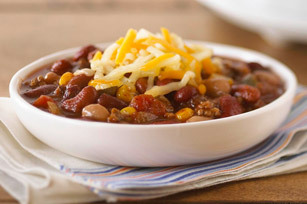 Try this simple slow-simmering beef chili recipe. The salsa is the quick fix—it adds a nice little kick plus saves on prep. Brown meat in skillet; drain. Add to slow cooker along with all remaining ingredients except cheese; stir. Cover with lid. Cook on LOW 5 to 6 hours (or on HIGH 3 to 4 hours). Stir just before serving. Ladle into bowls; top with cheese. For added colour and flavour, top individual bowls of chili with sour cream, Oscar Mayer Real Bacon Bits and/or coarsely crushed saltine crackers.